WW1 Reenactments Equipment : Great War Tommy WW1 Food Rations Labels : Cadburys Dairy Milk Chocolate wrapper, c 1910. 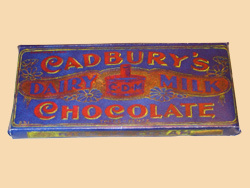 WW1 Reproductions and WW1 Reenactors Equipment / Kit - Cadburys Dairy Milk Chocolate wrapper, c 1910. Cadbury's Dairy Milk Chocolate wrapper, c 1910.